As your primary partner in health care, Central Vermont Medical Center wants to help you find ways to promote and safeguard your own well-being through classes, support groups and other wellness resources. You live here. So do we. We think you'd agree that central Vermont is a wonderful place to live, work, and stay healthy. We have an abundance of natural resources and community spirit that contributes to the high quality of life we enjoy in our region. At Central Vermont Medical Center, we pride ourselves in being an important part of the community of 66,000 Vermonters we are here to serve. Our staff, volunteers, donors, patients and physicians are your friends, family and neighbors. They are ours too. Whether you're looking for a doctor, trying to improve your diet, starting a family or recovering from an illness - we're here to help. 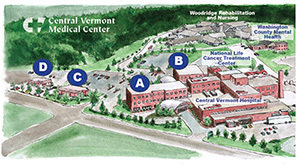 Central Vermont Medical Center - central to your well-being. As part of our commitment to the community, we offer many classes and workshops that promote good nutrition, physical activity, and healthy lifestyle choices for Vermont adults, children, families and communities. We also collaborate with other community organizations in projects and events geared toward improving the health and wellbeing of central Vermonters. As your primary partner in health care, we want you to know what you can do to promote and safeguard your own well-being. Use the resources listed on our site to learn more about the health issues confronting you, your family and your community and do what you can to maintain your own good health. Our listing of support groups provides local and national contact information for groups that can help you get the help you need. Our events listing also shows meeting times and locations for many local groups. Learn more about volunteer opportunities at CVMC.